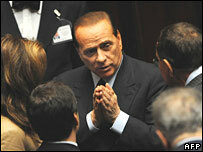 Italian Prime Minister Romano Prodi has won a first vote of confidence in the lower chamber of parliament. As expected, the Chamber of Deputies voted by a majority of 51 to keep the centre-left coalition. But all eyes are on the Senate, where the loss of a small allied party has cost Mr Prodi his majority. A vote there has been set for Thursday. 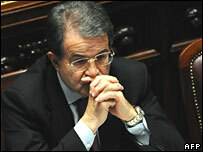 Mr Prodi has been urged to resign before then - including by the country's president. The crisis was sparked by the withdrawal on Monday of the centrist Udeur party - and its three seats - from Mr Prodi's ruling coalition, costing the prime minister his Senate majority of one. Udeur party leader and former justice minister, Clemente Mastella, pulled out after being forced to quit last week following his implication in a corruption inquiry. Three other senators, including the former Prime Minister, Lamberto Dini, urged Mr Prodi to quit on Wednesday to avoid holding the Senate vote. The BBC's Christian Fraser in Rome says the lower house vote was a reprieve for Mr Prodi. Our correspondent says there are always shifting loyalties in Italian politics and plenty of phone calls are no doubt being made to try to muster support - but it looks increasingly unlikely the prime minister can win in the Senate. Silvio Berlusconi, the conservative former prime minister who was beaten by Mr Prodi in 2006 elections, wants to see the premier defeated in the Senate. This would trigger calls for snap elections, which polls suggest Mr Berlusconi's centre-right Forza Italia party could win comfortably, our correspondent says. He says the other more likely option, favoured by President Giorgio Napolitano, is a caretaker government capable of bringing all these different sides together to force through much needed electoral reforms, before a future election is held.